According to the UN Food and Agriculture Organization (FAO) 1/3 (which is 1.3 billion tons) of the food produced for human consumption is lost throughout the supply chain, before reaching the retailers, or wasted by consumers. In the first case, the loss of food is due to the imperfections in the production process (harvesting, packing, storage or transportation), market prices adjustment and legal frameworks. n a world where there are still more than 800 million undernourished people, though decreasing, we cannot bear any longer this impressive amount of food spoiled, which also means a waste of labor and resources. From some calculation done by the FAO the food we throw into the trash costs us 250.000 billion liter of water, 1.4 billion hectare of land and 3.3 billion tons of CO2 emission. 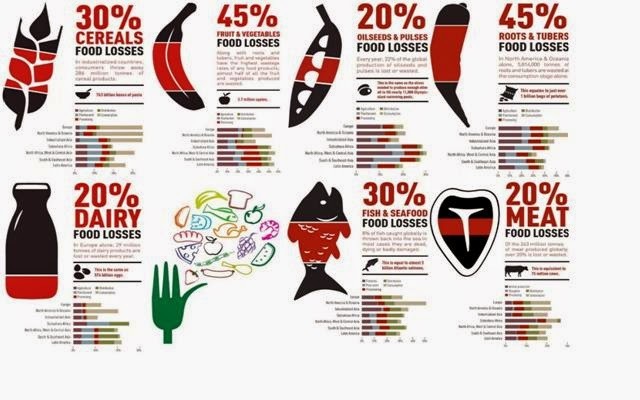 The following table shows the composition of food losses (FAO). On the other hand, there has been an increase of people and institutions’ awareness about the issues and problems related to food. The Second International Conference on Nutrition, taken place last November in Rome with representatives of more than 170 Governments, was mainly focused on addressing malnutrition in all its forms. The effort is being sustained through the outgoing “2015 series of international conferences on food loss and waste reduction”. As the Expo is approaching, topics related to nutrition are gaining more and more attention in Italy. The Italian Minister of Environment with Last Minute Market have recently released the Bologna Chart “Stop food waste, feed the planet” to be signed by the European Governments during the Expo. The objective of this chart is to develop a long-term commitment and synergies among European countries against the food waste which at global level has a significant value of 2060 billion Euros: 4/3 of Italian GDP. The Chart is planned to be signed during the World Food Day on 16th Oct 2015. To solve the moral paradox of a shameful inequality where for every starving person there are two struggling with obesity (805 million of undernourished and 1.5 billion overweight), where there are 36 million people perish every year because of lack of food, the waste, as well as all the other aspect of nutrition, must be at first priority in Governments’ Agenda. We have to be aware of the challenge we are going to tackle. We have to be ready to sustainably feed the planet.